You'll probably be aware of the approach, I'm sure. A/B testing, also called split testing, involves your site serving one of several versions of a page to show to a site visitor. The aim is to usually find a better approach to converting your visitors. Put simply, how do you know if the changes you made to a page are working better than the earlier version unless you can compare them side by side? A/B testing allows you to make changes from a position of intelligence - knowing the impact of the changes you make allows you to learn what works and what doesn't, and make sure that you repeat the successes and not the failures. My first thought as often the case in WordPress, was is there an AB testing plugin to help? After doing the usual Google searches, I discovered several A/B testing WordPress plugins, the best of which seemed to be Max A/B. It's a comprehensive plugin, and as a result pretty complicated. The problem - Max A/B seemed to me to duplicate a lot of the metrics and data capture that is really the job of an analytics tool and the fact is, mostly all of us already have a system installed on our sites that is specifically geared around telling us how our site performs - Google Analytics. It just didn't seem to make much sense to install something else that duplicates something I already have - so I wanted to see if there was a simpler method to allow us to use Google Analytics and without installing a plugin. I discovered that there is - and it's provided directly within Google Analytics. I use Google Analytics a lot, but this particular feature has passed me by. Apparently it used to be a separate system called Google Website Optimizer, but has been merged into Google Analytics back in August 2012. Content Experiments is a somewhat different approach from either standard A/B or multivariate testing. Content Experiments is more A/B/N. You're not testing just two versions of a page as in A/B testing, and you're not testing various combinations of components on a single page as in multivariate testing. Instead, you are testing up to five full versions of a single page, each delivered to visitors from a separate URL. Great - perfect for what we wanted to do, which was to test one of the membership benefits pages on Smart Insights and easy enough to make it work with WordPress on the surface. It recognises that a user is on the page that you're wanted to experiment with, and then randomly sends them off to one of the other pages you've got in the experiment. As a result we can set each version of the page up as a separate page within WordPress, and add each URL to the experiment within Google Analytics. Firstly, log in to your WordPress site as an administrator and browse to the edit screen for the original page. Once there, look in your browser's URL bar to get the page ID from the URL. 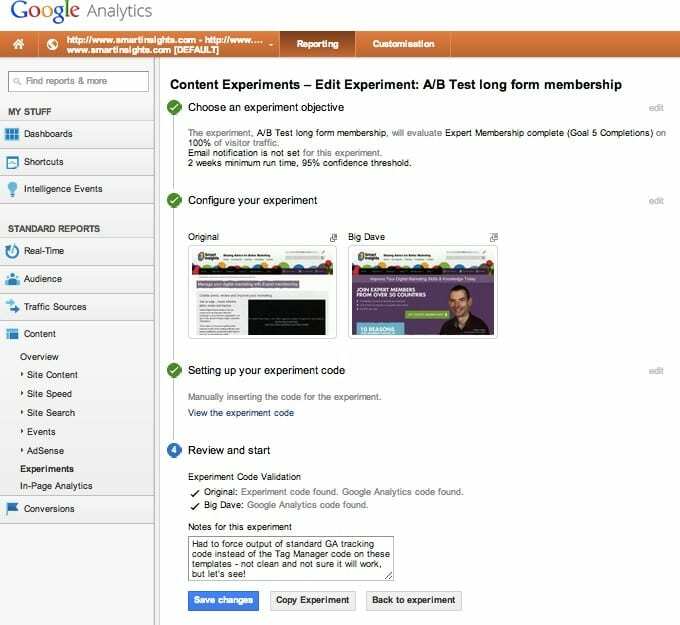 Once installed on your site, Google will automatically randomise which of your test pages your users see and start to measure the success of each, and depending on the length and configuration of the experiment will eventually declare a 'winner'. I'm keen to hear what other WordPress users are using for doing simple A/B testing in WordPress - are you using a plugin such as Max A/B or have you had any experience of Google content experiments?